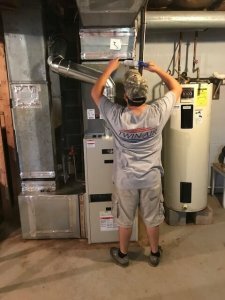 No one likes to hear about having to spend more money and mental labor on something they’d rather not think about and which doesn’t seem to be causing any immediate problems, but getting your furnace, boiler, or other HVAC system inspected once a year is just necessary. The good news is that it will save you time, money, and trouble in the long run. To keep a warranty valid. Some companies that offer warranties on their systems require yearly preventative maintenance, and not getting them inspected might void the warranty. To reduce breakdown risks. You know how a furnace only breaks when it’s freezing outside or company is over? That’s not a coincidence. When it’s cold and people are constantly opening the outside doors is exactly when your system has to work hardest, like an athlete’s heart works harder when she’s running a marathon. If your heating system is clogged with soot or improperly ventilated it could break down just when you need it most. To increase system lifespan. Soot and other buildup make it hard for many components to function, and the strain of working through that can spread to the entire system, shortening the time it will keep working before breaking down. A couple hundred dollars now will likely save you several thousand in the future. To save energy costs. If your system is fighting against soot, leaks, etc., it’s not just going to cost you in the future; it’s costing you now, through decreased efficiency that makes you spend more fuel for the same amount of heat a clean system would have given you. Ideally you should have it done in the fall before the temperature drops, but if you can’t get an appointment that soon, just get one as soon as you can. HVAC system maintenance is like changing the oil in your car: it can keep going for a bit, but it will eventually break down and be far more expensive than if you just paid for the maintenance. A heating system check can cost between $100 and $180, depending on what kind of system you have (gas is easier and cheaper to clean than oil). Call us today at 703-754-1062 or contact us online.